It might very well be true that Weis Jr. possesses a prodigious football intelligence. 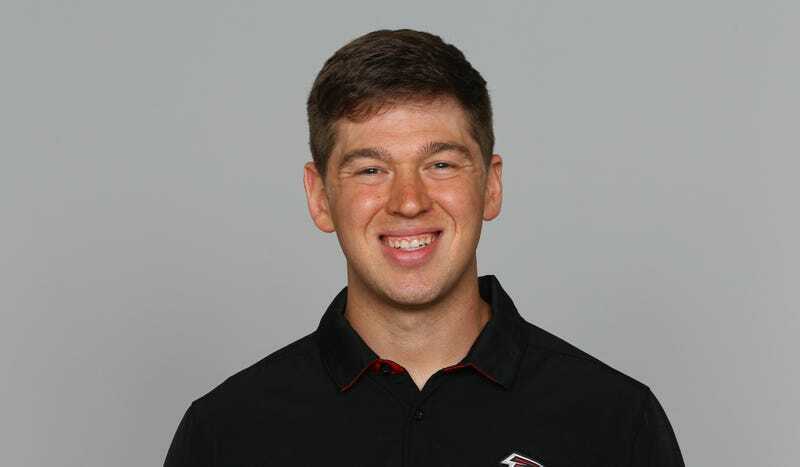 He worked for Kiffin before as an offensive analyst at Alabama, then as tight ends coach at FAU, before being plucked by former Alabama coworker Steve Sarkisian to serve as an offensive analyst with the Atlanta Falcons. It’s an impressive C.V. for someone so green, but to think he’s ascended the ranks simply because of his abilities would be laughable. His name is Charlie Weis, and even if his father is most known as a punchline for struggling at Notre Dame, he coached in the NFL and in college for almost 40 years. This is how it generally works in the football world. Coaches stock their ranks with relatives. There’s Jay Harbaugh at Michigan, Jon Richt at Miami, Sean Snyder at Kansas State, and plenty of others. It’s not unique to college football either. Just last week, the Panthers hired retread failure Norv Turner to be the team’s offensive coordinator. Naturally, he brought along his son Scott to serve as QB coach. Florida Atlantic in particular tells the entire story: Lane Kiffin was a hilarious failure at USC, Tennessee, and the Oakland Raiders, and he was fired from Alabama a week before the national championship game. He continued to fail upward for a decade because his father is legendary defensive coach Monte Kiffin. Monte now serves as a defensive assistant, and Lane’s brother Chris is the defensive coordinator. The OC job that Lane Kiffin hired Weis Jr. into was previously occupied by Kendal Briles, the son of disgraced former Baylor coach Art Briles. At this point, Kendal is probably a perfectly competent OC, though he was only able to accrue the necessary experience because he got to work for his dad. The primary effect of nepotistic hiring practices isn’t necessarily that a herd of unqualified failsons get jobs coaching the tight ends or “consulting” on the defense, it’s that a pedigreed group of people related to prominent coaches have the barriers to entry lowered almost completely for them. The sons and relatives of football coaches will continue to get starter jobs in perpetuity, and whether they are qualified or not to be hired for these positions doesn’t strictly matter. The power structures of football are such that people like Chris Kiffin and Charlie Weis Jr. continually find themselves being given opportunities because of the families they come from.